Legenderry: Green Hornet #2 by Daryl Gregory and Brent Peeples moves the action into high gear as Hornet and Kato try and track down the infamous Veiled Lady. A gang war has broken out and there's a bounty on Hornet's head. And it gets worse for our daring heroes. After using some creative methods to get some intel on the whereabouts of the Veiled Lady, they soon realize they'll have to go through the powerful Tik-Tok first. What seemed like an easy task soon goes haywire and things get even more dangerous for the dynamic duo. Gregory plots a great story with Hornet and Kato squarely in the middle but lends time to the mobsters who are making their moves along the way. It's quite a feat juggling several storylines but I like how the bad guys aren't just fodder for the heroes to beat up. They're not window dressing they're actually quite formidible and that's what we want in our villians. It makes the eventual triumph of our heroes all the more rewarding. That triumph seems to be in question at the moment but Legenderry: Green Hornet brings the action in cinematic ways that elevate the book and give this classic hero a story worthy of the legend. From fighting the Deacon henchmen and henchwoman to using clever gadgets, LGH is a fun exciting series accessible to all fans old and new. Peeples creates a bold and colorful canvas that bursts with energy. The steampunk influence results in many darker, metallic colors like the Tik-Tok's copper appearance. The fight scenes are choreographed well and shot in great layouts. 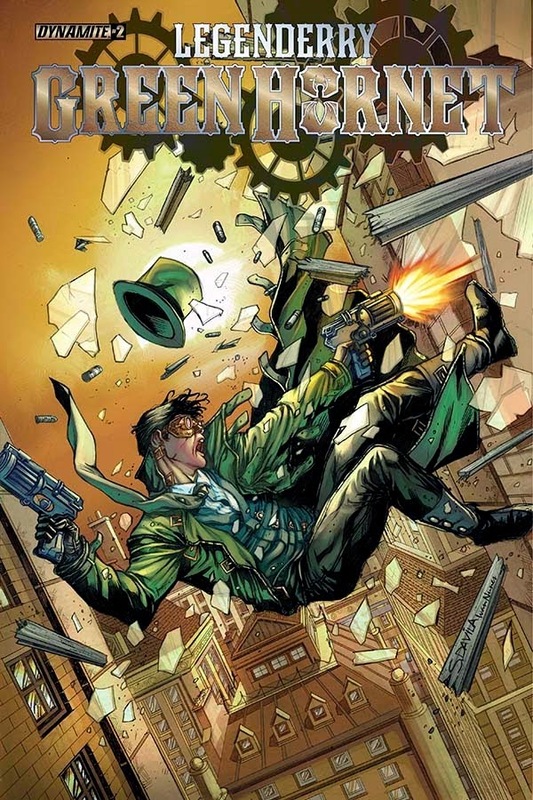 Legenderry: Green Hornet is another great series from Dynamite that is hard to resist.